SAUSAGE AND EGG BREAKFAST ENCHILADAS — Stuffed with scrambled eggs, sausage and cheese, these breakfast enchiladas are a morning twist on a classic Mexican meal. My boys are big fans of breakfast burritos, so I had a hunch that these Sausage and Egg Breakfast Enchiladas would go over pretty well. They were a big hit! 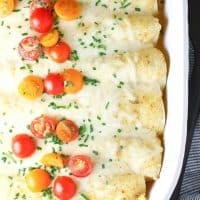 I especially love that these enchiladas can be put together the night before and popped in the oven the next morning. There’s nothing better or more convenient than a make-ahead breakfast. I also love that this is such a versatile recipe. 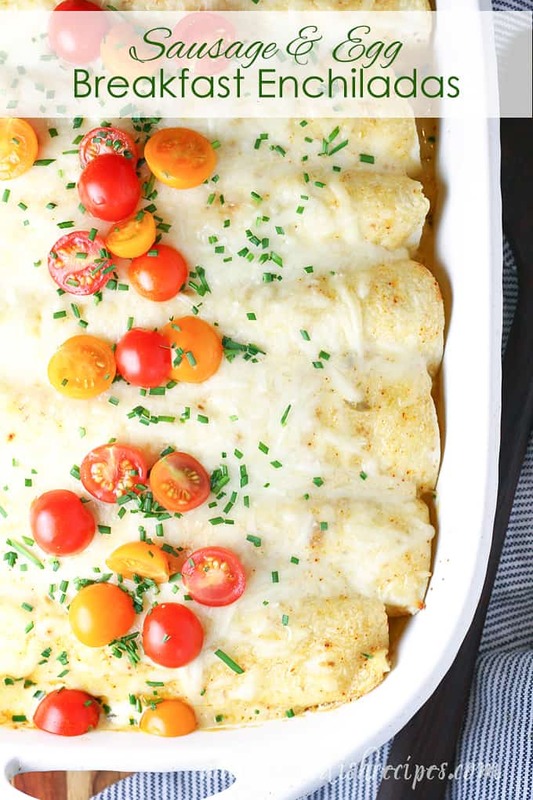 You can use either ground breakfast sausage or Italian sausage in these enchiladas. And of course you can switch up the type of cheese you use. You can also substitute ham or bacon for the sausage, or add mushrooms, bell peppers or black beans to the filling. You could even swap out the sauce for your favorite enchilada sauce–the possibilities are endless! And don’t forget all the optional toppings. I love fresh tomato and avocado, but my husband and boys are more inclined to cover their breakfast enchiladas in salsa. Sour cream, cilantro and green onion are also great toppings. If you love to put in on a taco, it will probably go well with these enchiladas too! If you’re looking for something different to serve for a weekend breakfast or brunch, these enchiladas are the answer. Especially if you’re a fan of Mexican food like we are. However you prepare these breakfast enchiladas, they’re a unique and tasty change from the usual breakfast casserole. Be sure to save this recipe for Sausage and Egg Breakfast Enchiladas to your favorite Pinterest board for later. In a medium skillet, cook the sausage until browned. Drain. Heat olive oil in a large non-stick skillet over medium heat. Add the onions and garlic and cook until soft, 3-5 minutes. Pour the eggs into the skillet with the onions and cook, stirring frequently, until eggs are thickened but still slightly moist. Remove from heat and stir in cooked sausage, green chilies and cheddar cheese. Season egg mixture with additional salt and pepper, if needed. In a medium bowl, whisk together the green enchilada sauce, cream and chili powder. Lightly grease a 9×13 inch baking pan. Spread about 1/2 cup of the green enchilada/cream sauce on the bottom of the pan. Spoon about 1/3 cup of the egg mixture into the center of a tortilla and roll. Place in pan, seam side down. Repeat until all of the filling has been used. Pour the remaining sauce over the enchiladas and sprinkle the Monterrey Jack cheese evenly over the top. Cover with foil. (If desired, enchiladas can be made to this point and refrigerated overnight before baking). Bake for 15-20 minutes. 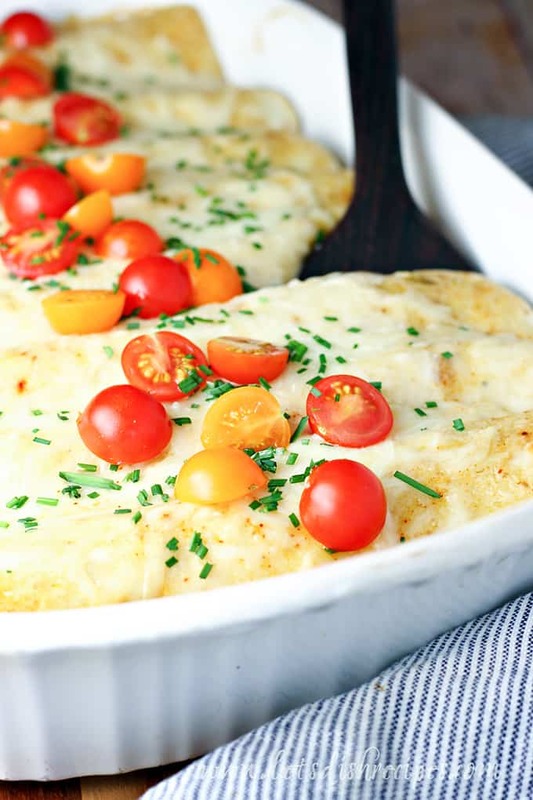 Uncover and bake about 10 minutes more, or until sauce is bubbly and cheese is golden. No beans??? I……I think I love you!! I HATE beans, but almost every recipe similar to this that I’ve found includes them and doesn’t tell you what to change if you don’t want to include them. 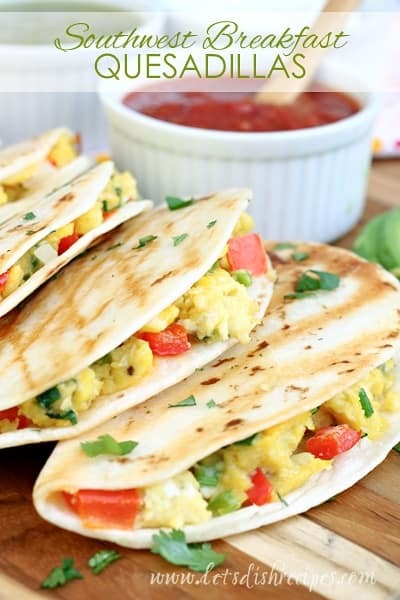 I love the idea of breakfast enchiladas! 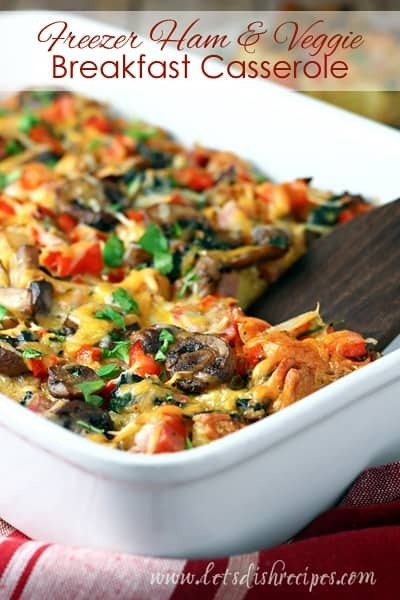 Make-ahead breakfasts are the best, especially this time of year! This was SO good! I made for dinner on Good Friday and omitted the sausage, added some diced red pepper to the filling for a few, used the pepper jack on top and sprinkled with cilantro after baking. They were filling and satisfying. 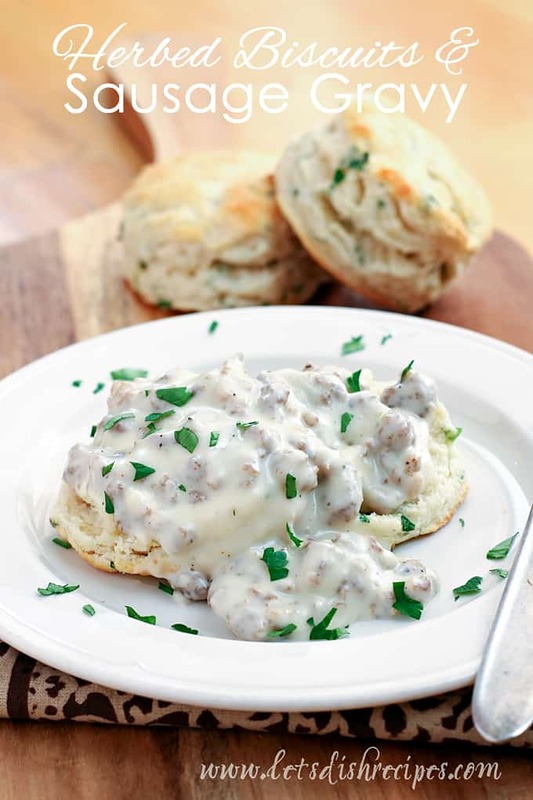 I am excited to make them again, with the meat… and for breakfast with overnight guests…. and again for an easy dinner. Mostly, I just can’t wait to make them again! So happy I found this recipe! looks amazing! can i make ahead and freeze? I’ve made these for my family 2 weekends in a row and they disappear faster than I can dish them out!! I make it the night before (so I can sleep in a bit) and throw it in the oven before the kiddos wake up. It’s perfect! !